"A buddy and I just made a short trip to Lake Erie. We Drove Saturday, fished Sunday and Monday and drove back home Monday afternoon and evening. This was the 1st Lake Erie trip for both of us. I started communicating with Juls, one of Walleye Central's moderators, last August. I decided that we would use her services after our 1st email exchange. It was a wise decision. A single statement made by my buddy says it all. His comment on the way home was "I am done going to Canada and will be going back to Lake Erie and will be hiring Juls every time". We had no idea what to expect, but were very impressed with the hospitality and fishing experience she provided. She picked us up at our motel the 1st day and even agreed to joined us for dinner. We were (probably still are) novices at fishing with planer boards. She was a good teacher and was very patient with a couple of almost senior guys that needed more than a little coaching to do it right. The best part of the story was the fishing. Sunday, day one, was a little slow. We got four Walleyes and then decided to have some fun catching perch. Monday was a different story. We spent no more than 4 hours fishing for Walleyes and boated 14. 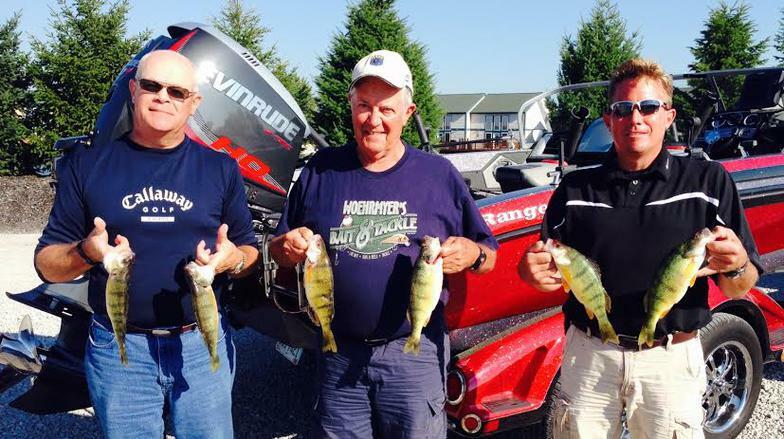 Two were over 10 pounds and the top five averaged 8.5 pounds. We had a great time and will be repeating the trip, including hiring Juls if she will have us. Larry and I will go together again, he will be making a trip with his grandchildren and I will be arranging one with my wife, daughter and granddaughter. Larry and I would plan our family trips together, but we would both want to use Juls and her Ranger isn’t big enough for that. 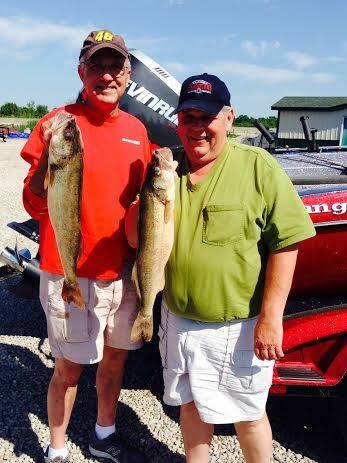 I have been to Canada and experienced a 100+ Walleye day for 2 ½ guys (don’t ask) and this was far better. I will take the quality we caught over quantity any day." "Read the blog and it was awesome! All the guys at Wesco are really excited and now all want to come out and fish with you. I will know in a day or two but it looks like they want to book a trip with you in May! Thanks again for yesterday and it really was a fantastic day!" My wife and I took a charter with Juls in April of 2013. We were impressed with Juls from the start and immediately felt at home with her, especially since she allowed us to park our RV in her driveway! We were lucky that in a string of bad weather Juls picked the exact right time of the day to get out on the lake safely. On a 4 hour charter, we immediately got down to business. She saw things on the lake that made her instincts get us to the exact spot where the fish were biting. She quickly figured out the ideal setup (proper lure, depth, and speed) to get the attention of the biggest walleye we have ever seen! At one point, we had a double and then a triple to end the charter with 6 (3 Fish Ohio). We got off the lake just before the waves kicked up and the rain came in. Our day could not have been more perfect. On the personal side, my wife is new to fishing, Juls gave my wife the confidence she needed to get more comfortable with her fishing. Renee is now excited to go fishing any chance we get. Thanks Juls! We hope to become regulars! "Thanks again for the great day today. These past 2 charters have been my best days on the lake I ever had. See you on the 16th.!" My son and I went with Captain Juls on her Ranger for a trolling seminar on Lake Erie this weekend. I have fished the Lake for over 40 years and thought I knew everything about walleye fishing but, I must admit, I was wrong. Captain Juls is the real deal! Her expertise, dedication, commitment, and integrity set her apart from most Charter Captains. We not only caught walleye, but she was constantly teaching and suggesting different techniques of how to catch those wonderful fish we all chase around the western basin for six months out of the year. I appreciated the opportunity to see how a true professional operates. It’s apparent that Captain Juls loves what she does and is a great teacher. I look forward to the next time my son and I can get out with Captain Juls for another Walleye adventure. Brought two friends of mine from work to fish with Juls (their second time even fishing, both times with Juls) We had a great time again! Much nicer weather this time, and ended up with a good catch of 14 nice walleye . We came from Michigan... and, yes, we have plenty of walleye and charter captains in Michigan, but fishing with Juls is just a blast! She is very knowledgeable at what she does, has a great personality, and is cut out for this type of work. I have known Juls from our tourney days, but never really got a chance to fish with her. Dion and Sabrina refuse to fish with anyone else. I, myself, let my friends reel in all those walleye while Juls and I set and net, so if anyone reading this is on the fence about fishing with one of the best charter captains I know, just do it! You will have a blast, I promise. We will be back again Juls! Titled: "ANOTHER EPIC ERIE FISHING TRIP"
Juls made the most scrumptious almond pound cake, and I chowed on many pieces all morning, and yes, I forgot to take some for the ride home – UGH!!! And let’s talk about some “de-factos” on the ERIE waters, and Juls newest boat, we all caught a fish (probie included, not mentioning his two misfires), we set our own lines, Juls let us net one fish, we had a double-catch (as James’ screamed to the entire lake), no ONE had to go to the bathroom, James forgot a to set the clicker on a real-in and Juls ALMOST forget to correct him, and WE LIMITED!!!!!!!!!!!!!!!!!! AS always, Juls brought HER A+++ game, Captain personality, plus her wonderful self, and phenomenal snacks and lunch. 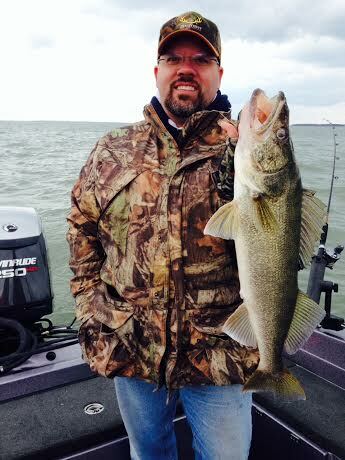 · Marc, "This was the most memorable fishing day I had on lake ERIE." · Todd, "I can’t believe SHE got me to touch a fish". · Captain Juls, "There is nothing on this boat that we can’t make right, so don't worry about screwing up. Oh, and I even have a bucket and toilet paper if you need it" – YIKES!!! What a tremendous day on the lake; the weather was more than perfect, companionship & camaraderie was at an all-time high, we fished on a flagship of a boat, and again was lucky to have a remarkable captain…. Did I mention already, we LIMITED!!! My last comment is my first comment (email subject), it was an EPIC day….. Thanks everyone for the memories. I LOVE fishing! And, it’s even more enjoyable when you have great group of people to share it with…. PS… Did I mentioned we LIMITED? LOL Even with having a PROBIE (Todd) on board – LOL!!! I would like to thank you for the great day Jeff and I had fishing with you, you truly know how and where the fish are. I must say your blog on walleye was very kind about fast learners, boy thank god you were patient with us. This day was on his bucket list and your expertise and captainship made it a great day for both of us. I hope to make it up before the end of September so we can have a great day of perch fishing with you. I meant to send you a thank you sooner, but time just got away from me. I wanted to thank you for the awesome trip you gave my husband and me a few weeks ago for our anniversary. It was a amazing and I am so glad that he picked you as our captain! You were incredibly knowledgeable and taught us so much that we can now use on our own boat. 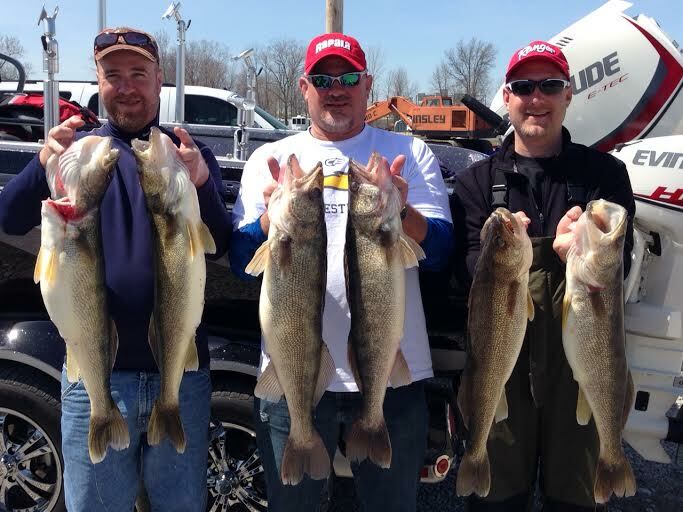 We have been rather unlucky with walleye in the past and had the saying that, “The walleye hate us.” You completely blew that out of the water with our 48-lb haul from our two man limit (FYI--It was about 15 lb. of filets when cleaned)!! I also wanted to thank you for your dedication to getting us out on the water that day (especially since it was your birthday). I really appreciate you giving us the option to wait until 11am to launch due to the high winds in the morning. I was so worried we wouldn’t get to fish on our trip since we don’t live locally, but your dedication and flexibility made it possible. Once again, thank you so much and we will definitely be back to book another charter with you! Thank you for a fantastic day and for the best fishing experience of my life. I have fished Lake Erie a few times a year since the early 1970s, but never have I had a better time, more success or caught bigger fish. Your boat is exceptionally comfortable and we could not have asked for a better Captain. You can rest assured we will be back next year! I consider myself a “walleye junkie”. Being from Wisconsin and fishing Green bay or Winnebago on a weekly basis. Myself, my brother and a buddy of mine decided this year to book an early spring trip to Lake Erie for trophy fish. Because we had never been there before we felt it best to hire a guide for a day or two to understand the lake and what was going on and then fish ourselves for a few days after. I booked a trip with Juls and we got WAY more than expected. It’s hard to know where to start. She let me keep my ranger at her house instead of it sitting at the hotel. She made homemade brownies. She took us to the best local bait shops, showed us the best places to eat in town and went to lunch with us after fishing. (even the day after we weren’t fishing with her). She took us to the best fish cleaning place in town. She checked in with us the day after our paid trips and we were on our own. She wanted to make sure we were on fish and told us where to go and what to use. I have fished many guided trips before all over the US and Canada but I have got to tell you, Juls totally goes above and beyond anything I have seen before to make sure you have a good time. Oh by the way I haven’t even mentioned the fishing-WORLD CLASS!!!!!! We limited out every day within an hour or two. With our best day being 16 fish- 8 of them going over 30 inches. What more can you say, other than we are making this an annual trip for sure!!!!!!!!!!!! !